All Night Owl Market stockings have the same colorful Pendleton® fabrics on both sides - no solid color fabrics on these stockings! 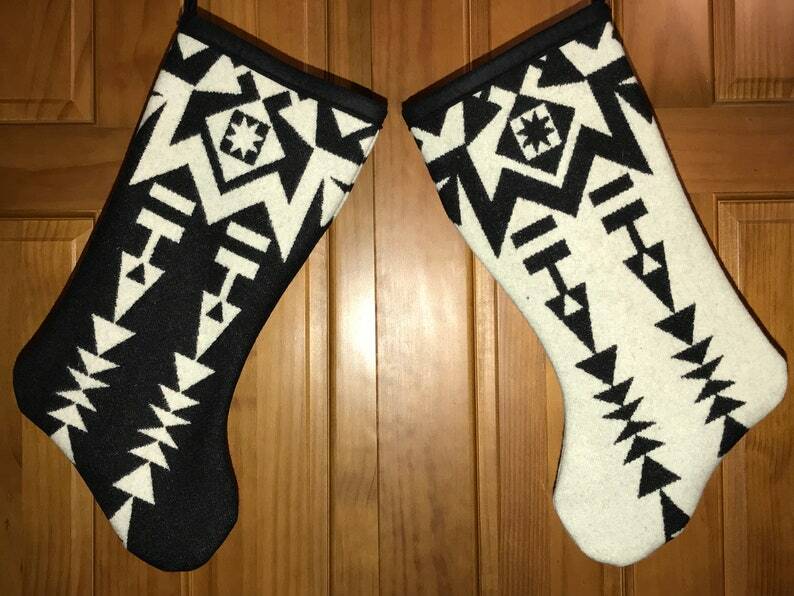 These unique Christmas Stockings are handcrafted from high quality Pendleton® coat weight wool. Beautiful and bright to complement your southwestern or cabin decor - durable enough to stuff full of goodies for the kids year after year. The top of each stocking and the large hanging loops are finished with coordinating Pendleton® blanket binding. Inner seams are completely finished. The stockings are 16 inches long. The top of each stocking is 7 inches wide, the width from heel to toe is 8 inches. Note choice of traditional or Kraft wrap in Buyer Notes. For multiple gifts, all must be delivered to one Ship To address. Beautiful work and just the right size. Payment is accepted via Etsy Pay and PayPal. Both payment methods accept most major credit/debit cards. A 50% down payment is needed before work can begin on custom orders over $100. Upon completion of your custom order, I will post your order on etsy with the balance due including shipping costs. Payment is expected within 7 business days unless other arrangements have been made. Customer Satisfaction is guaranteed. If you are planning to return your item please contact me within 5 days of delivery via Etsy convo prior to the return. Refunds will be for the purchase price. Returns must be shipped within 7 days of delivery and be in their original condition - cleaning costs will be deducted for cigarette odors. Buyer is responsible for return shipping costs. All orders are shipped within 1 business day, with the exception of made to order and custom items. Most made to order items will be shipped within 2 business days, however 3 - 4 days should be allowed. If your made to order item is needed more quickly, please contact me to verify current shipping schedule. USPS Tracking Information is provided on all purchases. All orders of $150 or more are sent with signature confirmation unless buyer requests otherwise. For International Shipping, any customs fees or other duties are the responsibility of the buyer. I am happy to accept custom orders. Wholesale is not available, however I can sometimes offer discounts when 10 or more items are purchased (not available in November & December). Contact me for more details.